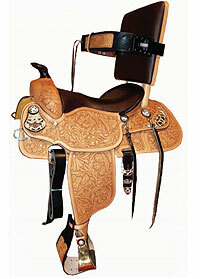 Do you know anyone that can make horse saddles for older people, like around the age of 60 and older. that would love to ride again. but think that they can’t. I am a health aid for older people. and was just asking about it. The saddle you have pictured is exactly what we have been seeking for our son with CP however, as it is with most needs-adapted equipment, it is cost prohibitive for the average family. With his miniature horse it took 3 people to let him ride; we finally sold it in frustration and I am just going to “double” him with me until he gets too big to manage. btw he is 7.